Born in Golub, Poland in 1922, Joseph Stanislaus Ostoja-Kotkowski (AM) was a prolific artist across diverse traditional and cutting edge mediums. From painting, photography, filmmaking and theatre design to fabric design, murals, kinetic and static sculpture, stained glass, vitreous enamel murals, op-collages, computer graphics and laser art, J.S. Ostoja-Kotkowski impacted. Ostoja won a scholarship to study at the Düsseldorf Academy of Fine Arts in Germany. Emigrating to Australia from his native Poland in 1949, J.S. Ostoja-Kotkowski trained for two years in the National Gallery of Victoria’s art schools while working as a manual labourer before settling in Adelaide, South Australia in 1954. His first one-man Exhibition was at the Royal Society of Arts in Adelaide. 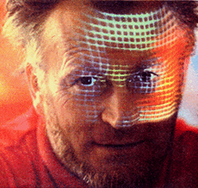 The Polish artist was renowned both in Australia and internationally for his ground-breaking work in chromasonics, laser kinetics and 'sound and image' productions. Ostoja's work in abstract expression saw him take out the Cornell Prize for the canvas "Form in Landscape". The iridescent images that Ostoja accidently discovered whilst rubbing his eyes began a lifelong fascination with light. His passion was further fuelled as he looked into the dazzling light and brilliant sunsets in Central Australia. Ostoja-Kotkowski became obsessed with capturing this intensity in every creative expression, from his cutting edge light settings in set designs, designing and constructing stained glass windows to developing his technique for rear screen projections which was subsequently adopted throughout Australia. In 1964 Ostoja designed the largest light mosaic ever staged up to that time on the facade of an 11 storey building. His innovative design for the 18 m bass relief mural on the new B.P. building in Melbourne was the subject of a film which won the "Blue Ribbon" Award in the American Film Festival in New York. In 1965 Ostoja designed and made the first light kinetic mural in Australia, and continued to evolve theatrical works using multi-screen and Multi-projector techniques. Ostoja introduced Op Art to Australia, both at Melbourne’s South Yarra Gallery and Sydney’s Gallery A. In 1966 noted architect Robin Boyd commissioned Ostoja to design two large Op murals for the Australian Pavilion entrance at the Expo 67. Being awarded a Churchill Fellowship enabled Ostoja to extensively travel the world, which inspired him to work with language, contemporary poetry and prose and computers. At the 1968 Adelaide Festival of Arts, Ostoja staged the first combined 'Sound and Image" production in the world using a laser beam. His massive sixty foot long, ten foot high "Space Scape" mural won the national competition for a mural for Adelaide Airport. In 1980 The Governor-General and his wife visited Ostoja’s studio in Stirling. The artist was invited by Christopher Hunt, Artistic Director of the 1980 Adelaide Festival of Arts, to exhibit his laser kinetics in conjunction with a holographic exhibit from the New York Museum. Ostoja’s extensive list of Awards included: 1967 'Excellence' AFIAP Berne Switzerland for innovative photography; 1969 Churchill Fellowship; 1971 Creative Arts Fellowship ANU Canberra; 1971 Fellow of the Royal Society of Arts London; 1973 Australian American Education Association Fellowship; 1991 Polish Order of Cultural Merit; and 1992 Order of Australia. Ostoja’s work is represented in the National Gallery of Australia, Art Gallery of South Australia, Art Gallery of Western Australia, National Gallery of Victoria, Tasmanian Museum and Art Gallery, Society of Fine Arts, Cracow, Poland, Peter Stuyvesant Trust, USA, Australian National University, Monash University. Ostoja died in 1994 on the Booth estate at Stirling South Australia, where he had lived and worked under the patronage of the Booth family for over 40 years. In 2008, the archives relating to Ostoja’s work were committed to UNESCO’s Memory of the World Register. This was a worldwide recognition of one of the world’s first true multi-media artists and a pioneer of both sound and light sculpture. Ostoja-Kotkowski was a prolific and highly innovative artist who is acknowledged both for his significant contribution to the Australian art scene and a founder of chromasonics and kinetic art. Read more about J.S. Ostoja-Kotkowski here!